Another year, and another April Fools Day is done and dusted. I am fairly certain that for journalists, April 1st is better than Christmas, as it marks the one day where media outlets make the news the wish they could report on daily. And as usual, the imaginations of the motorcycle media pool didn’t fail to disappoint. My colleague David Emmett had a timely story about the Losail International Circuit in Qatar, which hosted a nearly rained-out Qatar GP a couple weeks ago. As such, his piece focused on improvements Losail could make for inclement weather, namely a radiant heating system below the asphalt. It’s so crazy, it just might work. If you were confused by our WorldSBK coverage on Saturday, that’s because our man Kent Brockman had some fun with the race results and his debrief report, changing the names of all of the riders to “Jonathan Rea” as a nod to the Northern Irishman’s dominance so far in the Championship. Those results are now correct, by the way. Of course you know I can’t pass up some love on April Fools, so we ran two stories. The first one was about Ducati’s new “Quattrofromagi” superbike – I owe the idea to my fellow Two Enthusiasts Podcast host Quentin Wilson, so of course it was a pretty cheesy story. My other story included Aprilia, and how the Italian brand’s bag of well-lettered motorcycles are helping kids to learn and read good. As some noted in the comments, the idea of a motorcycle brand product-placing in a show like Sesame Street isn’t a bad idea. I make no apologies for my Michael Jackson savagery, however. How about from the rest of the industry though? In case you missed them, the highlights of April Fools Day are after the jump. 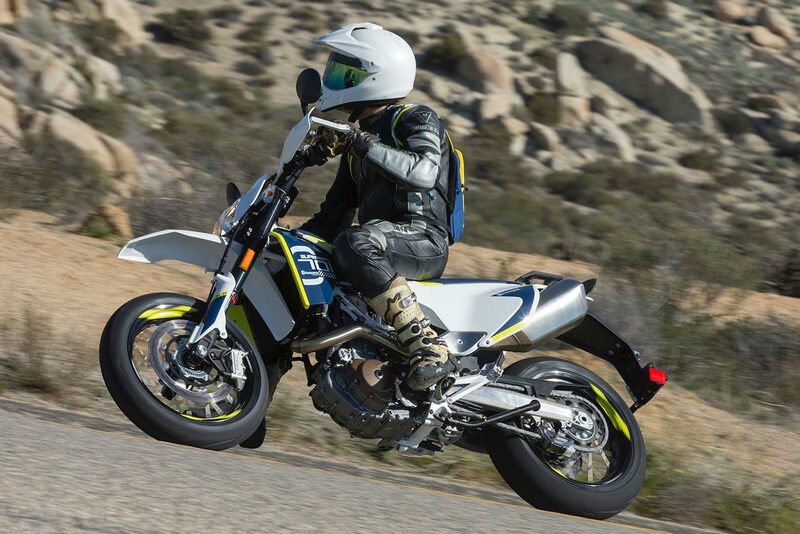 The idea is a riff on a Wunderlich concept, with BMW Motorrad supposedly taking the idea of adding an electric front-wheel drive to the standard GS package, for a hybrid two-wheel drive motorcycle. 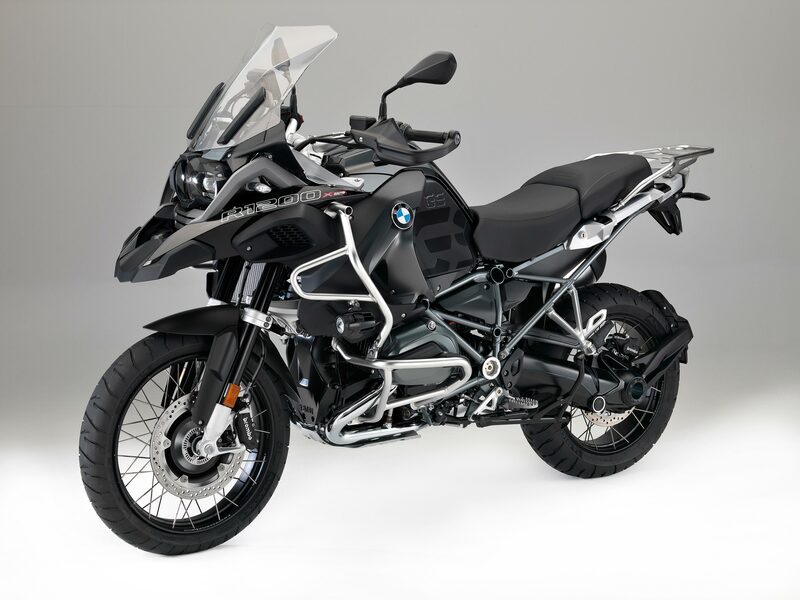 Zie Germans did a master-class job of treading between reality and fantasy in its press release, and the result is that it caught more than a few publications printing the story: ADV Pulse, Ultimate Motorcycling, & BMW Motorcycle Magazine…just to name a few. 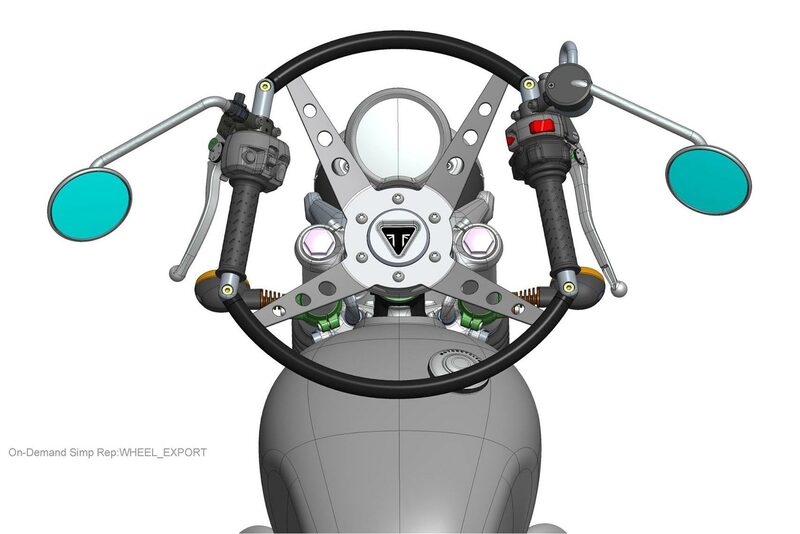 The Brits over at Triumph Motorcycles also got in on the April Fools action, with a funny “accessory” for its bikes, which looks a lot like a steering wheel. Aimed at catching new riders who have jumped on Triumph’s heritage line, the British marque’s “HandleWheel” is aimed at giving these green riders a layout that they would find familiar…we are just not sure how the mirrors work in a turn. The popular YouTube channel “FortNine” had a great video spoof for April Fools Day, which announced that the channel had been acquired by the folks at RevZilla (though, they never mention that online retailer by name). The video goes on to mimic some of RevZilla’s better video personalities, and all I’m going to say is that it is the best Bucci impersonation I have ever seen, and yes, I include Jersey Shore when I make that statement. It’s so good. Nice job, Canada. You can just stop reading there. You win Ultimate Motorcycling, you win….you magnificent bastards. We will never forget; we will rebuild; and you can take my Mountain Dew when you pry it out of my cold, dead hands. 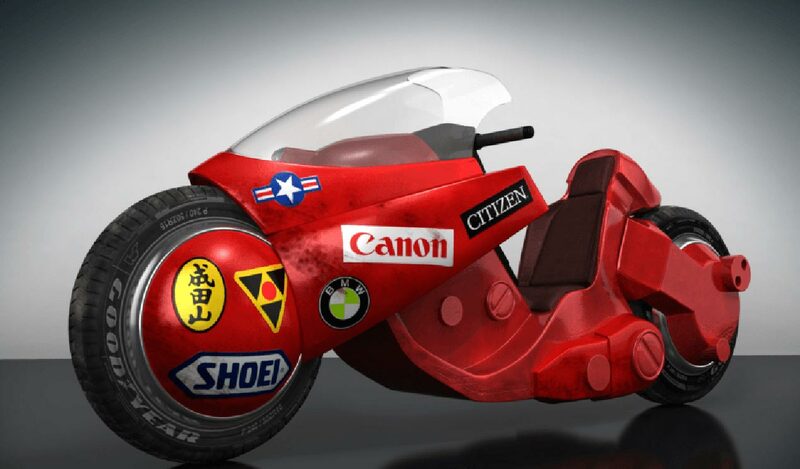 Again, our friends to the North brought the funnies, with a timely story about Honda’s first all-electric motorcycle…which will be based off the bike in the Japanese animation movie Akira. CMG imagines the Honda NM4 as the basis for such a machine, which in some markets is called the “Voltus” – so naturally, the electric version will be called the “ReVoltus” motorcycle. Yeah, we see what you did there. There is a good tie-in here though with a modified NM4 being used in Hollywood’s adaptation of The Ghost in the Shell, which helped to add a layer of plausibility. We scored an extra two-points on our scorecard as well, for being giant anime nerds and having a solid Star Trek reference. Last, but certainly not least, I can always count on a Mark Gardiner for some April foolery, and he never disappoints. Gardiner always spins a good tale (he can actually write a story, whereas people like me just pound on keys until the right order of words show up), and his imagination is always on-point. I assume his “Harley-Killer” story was meant for RevZilla’s Common Tread outlet, since it makes mention of the publication, but seemingly the story never made it to the company’s website. Gardiner did post it on one of his personal sites though, and we are glad he did. 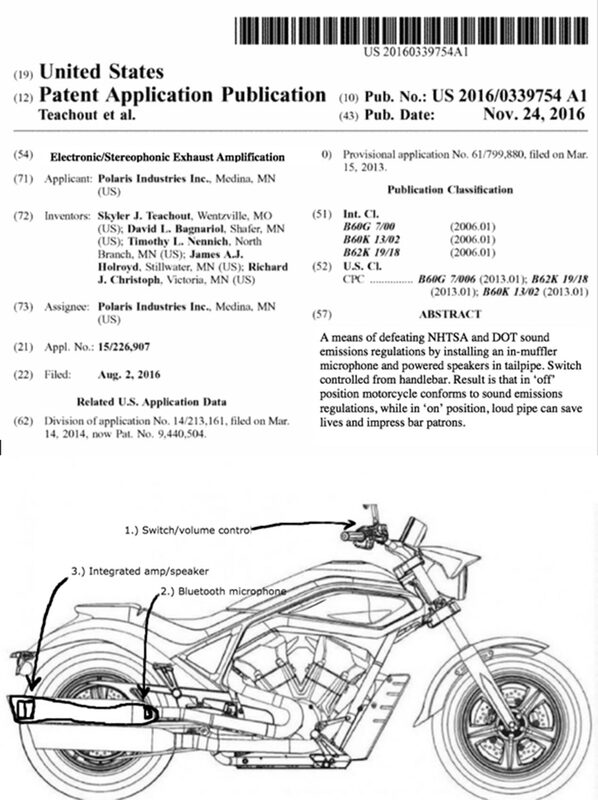 Complete with artwork, Gardiner’s post outlines the details of a patent that would allow Indian motorcycles to be louder than the law requires, through use of the new Loophole™ technology. With a couple good jabs at the Bar & Shield brand, ABATE, and the Trump presidency, this is sure to ruffle a few feathers, like any good April Fools story should. Did you see any good motorcycle-related April Fools jokes this weekend that we may have missed? If so, be sure to post them in the comments.